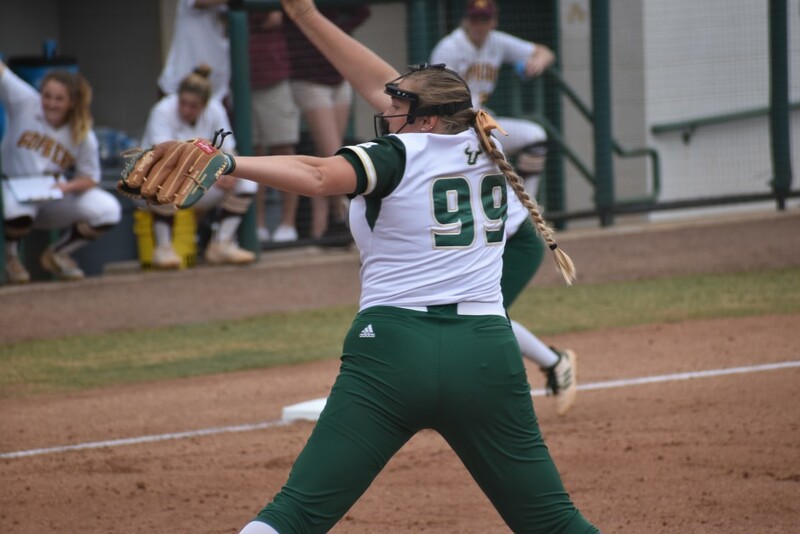 USF softball wrapped up its final weekend of nonconference play splitting a doubleheader at the USF Softball Stadium on Sunday. 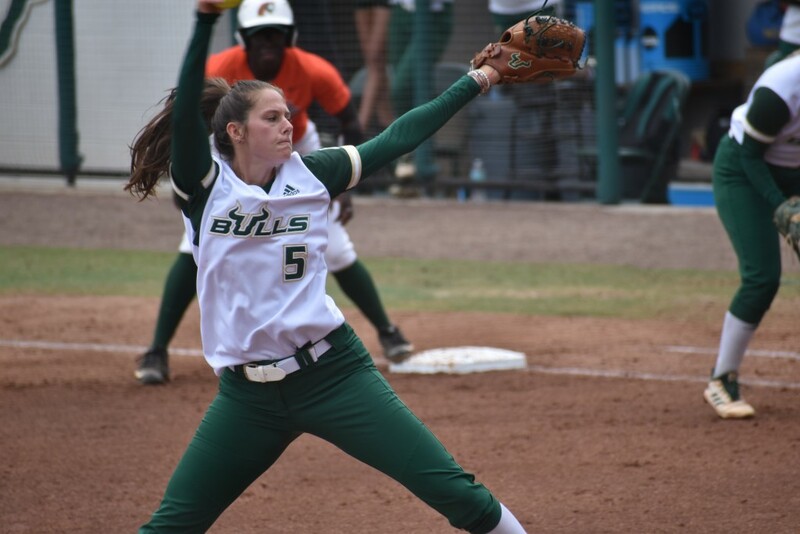 The Bulls defeated Florida A&M 7-3 before falling 3-0 to No. 21 Minnesota. Nicole Doyle found herself in a hole early. She had given up three runs before recording the second out of the first inning. Granted, a few calls didn’t go her way in the process. “The umpire might have blown the first one — the kid’s out,” coach Ken Eriksen said. “And then they sneak one into the outfield and then … we walk somebody intentionally to get the next guy, the next guy got hit. And then a pitch that hits a glove in the outfield. Doyle was indeed relentlenss. The senior settled in after the runs were scored, retiring 14 of the final 16 batters she faced and striking out four. Overall Doyle allowed only the initial three runs on three hits over five innings. 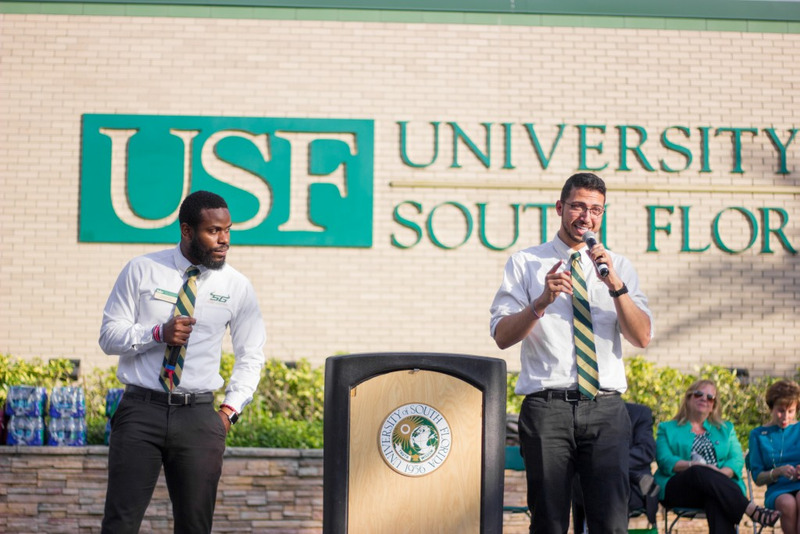 In addition to Doyle getting in a groove, USF’s offense was in full force, striking early and somewhat often on the way to the Bulls’ 22nd win of the season. A pair of USF runs in the bottom half of the first brought the Bulls within one, before an RBI single by Brooke Hartman brought in the tying run in the fourth. The big blow came off the bat of Macy Cook, who hit a solo homer in the sixth inning, which ultimately proved to be the game-winning run. The homer was Cook’s second of the season and second RBI of the game. Cheyenne Eggens relieved Doyle in the sixth inning, allowing no runs and no hits on her way to her fifth win of the season. USF was unable to replicate its offensive success in Game 2 against No. 21 Minnesota. The Gophers’ starting pitcher, Amber Fiser, was dominant and efficient — allowing no runs on three hits, only needing 76 pitches to throw six shutout innings. “It’s a lot easier, trust me when I tell you, to face a pitcher like that than it is somebody that’s chucking the ball all over the place and an umpire’s getting crazy by calling pitches off the zone,” Eriksen said. “You know Fiser’s going to come right at you. When she comes at you, it gives you a comfortable at-bat. Eggens pitched a complete game against Minnesota, going all seven innings, allowing only one earned run and striking out five. Combined with the game against FAMU, Eggens pitched nine innings, allowing one earned run on five hits, striking out six. Minnesota struck for two unearned runs in the third inning after an error by third baseman Dez Maldonado allowed the Gophers to put together a mini-rally. Eggens’ only earned run Sunday came on a solo homer in the sixth. After effectively wrapping up nonconference play — the only non-AAC game the Bulls have left on their schedule is an away game at No. 7 Florida on April 10 — USF opens AAC play with a three-game series against Tulsa starting Friday at the USF Softball Stadium. Last season, the AAC was ranked No. 4 in RPI as a conference and Tulsa is the defending AAC Tournament champions, defeating USF in the championship game last season. First pitch against Tulsa on Friday is scheduled for 4:30 p.m.